Merry Christmas friends! It's my absolute favorite time of the year! I love gift-giving more than anything. 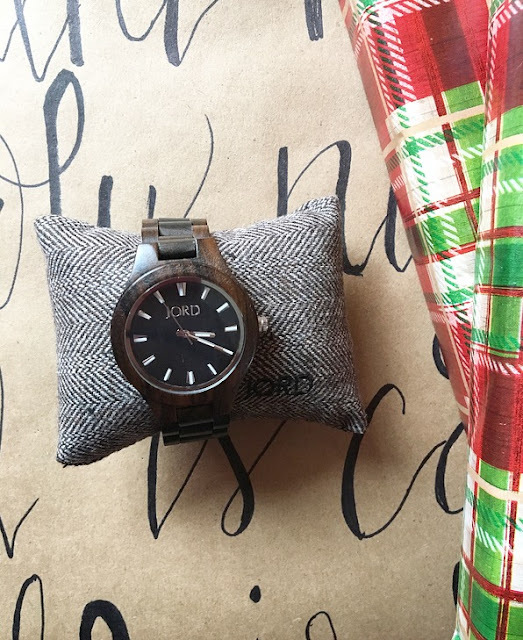 Finding that perfect gift, then seeing your loved ones smiles and excitement when they open it. This year, I have found the perfect gift for my husband. 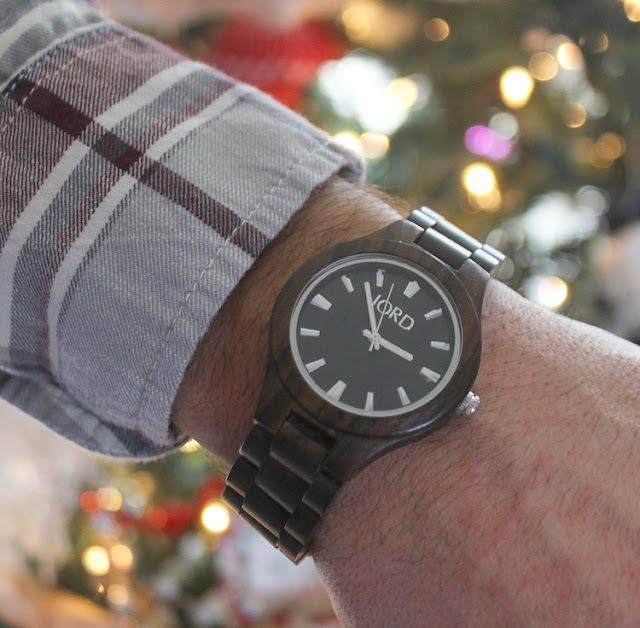 It's no secret how much I love MY wood watch from JORD...I get compliments on it everywhere I go. When I found out JORD now has watch engraving, I knew it would be the perfect gift for him! His old watch was outdated and honestly, not his style at all. For him I choose the Fieldcrest watch in "Dark Sandalwood". It has a rustic and sleek look to it that I just love. JORD offers two ways to engrave...you can choose to have the box engraved or the watch. JORD can engrave the back plate of the following watch series: Fieldcrest, Reece, Frankie35, Frankie, and Conway. 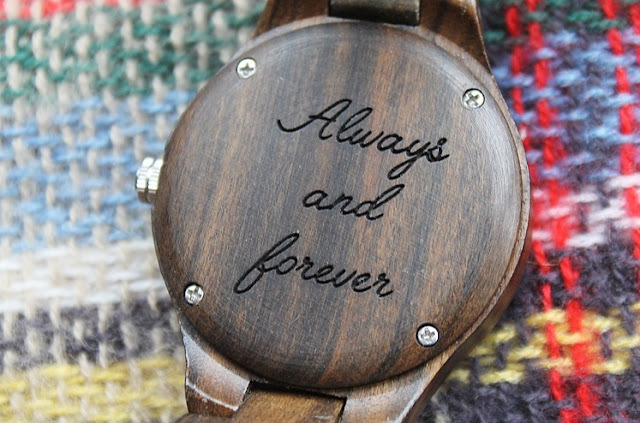 The cost of the wood engraving is $35 and you can choose block or script engraving. JORD can also engrave the side cedar wood presentation box that the watch comes in. The cost for engraving is $45 and you can also choose the block or the script writing. For my husband, I choose the script with the words "Always and forever". A little backstory on the phrase...we have been together since my Junior and his Senior year of high school. High school sweethearts if you may! Always and forever are words I use following "I love you". I know, I know, I'm being all mushy! But it was the first thing that came to mind when thinking of what to have engraved on the back of his watch. Short and Sweet! I knew it would make him smile too. 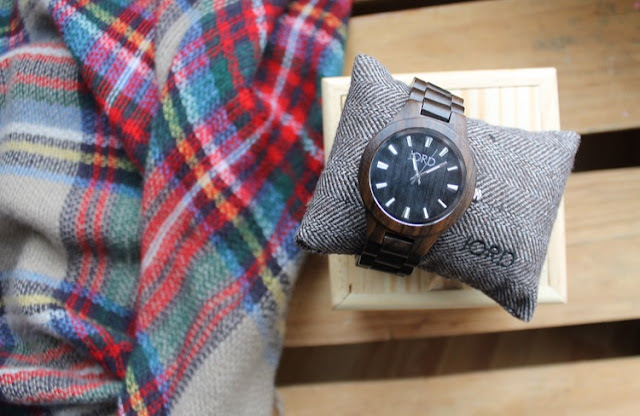 An engraved wood watch from JORD would make the perfect gift for anyone on your list. I have great news though..I am providing a link below for you to receive a $25 credit to any watch on their website! Simply click the link below, and fill out the requested information and you will be emailed your $25 gift code! Hurry though, you must order quickly to be guaranteed delivery before Christmas. An engraved gift is always a sweet sentiment for ones you love. Click link below for your code! 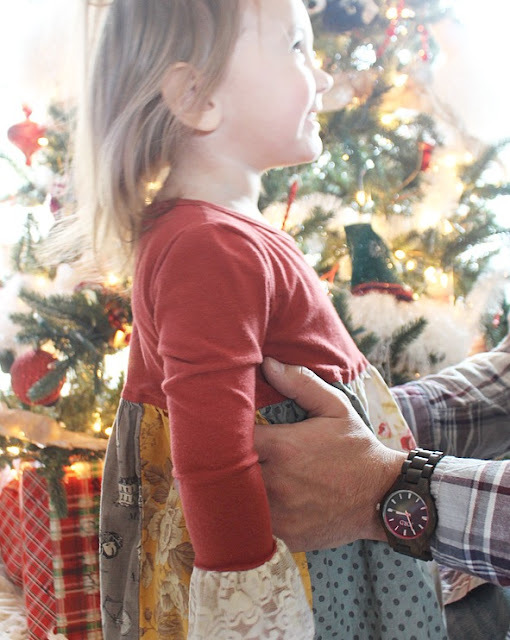 I gave my husband his watch a little early so he could wear it to all the Christmas parties. He LOVED it! I received product as compensation for this post. All views and opinions in this post as always are my own and no other compensation was provided. Such a beautiful watch, love the color and dial!